Solver BI360 is a comprehensive business intelligence suite to provide insights on business performance, efficiency and productivity throughout the organisation. This BI tool includes powerful features and seamless out-of-the-box integration with many business management solutions like SAP Business One and Microsoft Dynamics 365. 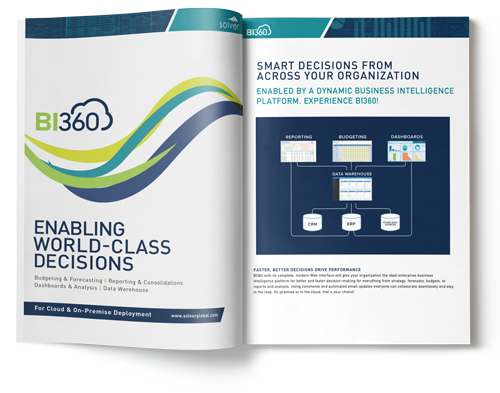 Solver BI360 is a popular business intelligence tool which automates the collection and analysis of data. Its drag and drop functionality, versatility and highly adaptable budgeting model allows the creation of accurate forecast and reliable models. Additionally the data warehouse module comes equipped with out of the box intelligence around financial reporting capabilities, enabling them to combine all their data and base their decisions on reliable information and actionable business insights.